Which travel carrier is better - acrylic or metal? 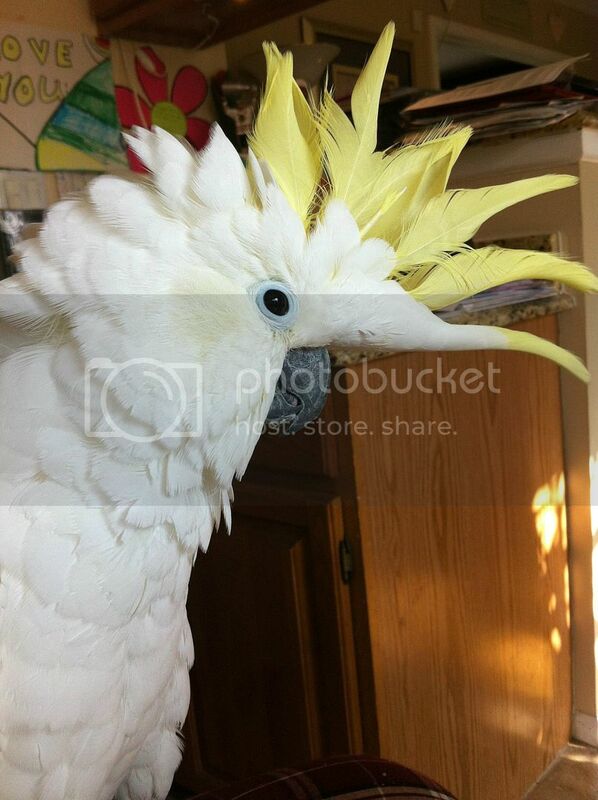 - Real Cockatoo Facts! You are not logged in. [Log In] Mytoos Forums Cages, Aviaries & Toys Which travel carrier is better - acrylic or metal? #249356 - 11/20/12 07:32 AM Which travel carrier is better - acrylic or metal? We recently adopted a LSC and are needing to purchase a travel carrier in order to take her to the vet for her first checkup. We originally brought her home in a plastic pet carrier, but she had chewed a large hole in it so I don't think I'll be buying a plastic replacement. I've found two alternate cage materials: metal and acrylic. The makers of the acrylic cages advertise that it's less stressful on the bird to be able to see what's going on, while the metal cages advertise durability. Any comments and/or suggestions on the way to go would be appreciated, as both types of cages are a large investment compared to their plastic alternatives. Can you give us links to the ones you are considering? That would help. Plus, how big should they be to fit our LSC? Should it be big enough form them to sit up straight, or cozy like the original plastic one we picked her up in ? (which I think was a cat carrier). I know a couple of people with the aluminum cages. They work great not only as a carrier but as a travel cage too. The size of the one you have linked to would be a great size. The acrylic ones can break and can be hot. I see on the one you are linked to though that it was barred doors which would help with air flow. These are good for carriers only due to it's size. 10 1/2" x 12 1/2" x 15". If it were me I would go with the bigger metal one, you'll use it a lot more. Thanks so much Nancy! I really needed input on this as it's an expensive decision so I want it to be the correct one. I have a Kings Aluminum travel cage for my M2s, and give it an A+. I use it as a travel cage, a "come to work with me for a few hours" cage, a "go outside while I weed the flower bed" cage, a "sleeping cage" when we are on vacation and so on. We even use it as a shower cage since it will not rust. I liked it so much I bought one of King's larger aluminum cages as a second cage to use in our second home (if they made one large enough, I would use it as primary cage). I haven't used an acrylic travel cage, but I do have two large cages with acrylic. My Cages by Design 3 x 6 foot cage has acrylic sliding doors, and I have another all acrylic 2 x 3 cage. I think they'd be wonderful for Amazons or Grays, but the cockatoo dust makes them difficult to keep clean. I'm constantly trying to scrub them so that I can see thru them. The material has held up well for years. I've been tempted to try an acrylic travel cage but I fear it will never look as it did the first day I bought it, based on my experience with the material in these larger cages. In summary, I'd definitely recommend the King's aluminum cage. I didn't even think of Bella's dust as being a factor, but after having her for a few weeks now I can see how it is a consideration. That plus the practicality that the metal cage will provide leads me toward investing in the King's aluminum cage. Thanks everyone for your help! I didn't even think of Bella's dust as being a factor, but after having her for a few weeks now I can see how it is a consideration. I had to laugh at this! You will soon find "dust management" one of your top considerations. Sorry, I didn't mean to get off topic but dust will affect most new cockatoo caretakers in ways they couldn't even imagine! I have to say that the acrylic carriers do seem to decrease the anxiety levels. I got Paulie that exact one from Amazon, and am glad that I did. He seems much more relaxed in it when we're traveling. I also like the fact that it protects.him from drafts. I've had all types of carriers and was so happy with this that I bought one for each of my birds. "dust management" ROFLMAO!!!! Yes the dust manages itself incredibly well coating everything in my home with a nice slick white coating! Now if I could just figure out a way to manage "it" I'ld be all set!! I have a wingabago and all the birds seem to like it. They enjoy seeing everything around them. The door is metal and it came with 2 cup holders and openings in the top so you can hang toys. Its easy to clean and having 3 sides acrylic keeps the wind out.